Day 1, 8:30 a.m.: I have a hot Starbucks double tall latte with a shot in one hand and a mangled program of events in the other. I'm juggling the two and spilling my coffee down my T-shirt while I try to decide whether I should go groove to the beat of Big Bad Voodoo Daddy or zone to the meditative melodies of the Master Musicians of Jajouka. On the other hand, I could go get my dose of NPR sarcasm with Andrei Codrescu or get down on British politics and social ills with Billy Bragg. Then again, I could check out some great short films, watch some cool performance art, take in a few avant-garde exhibits or just sit here in the park and finish my coffee. Too many choices, not enough time. I guess I just won't sleep for the next three days. Rolling Stone Magazine has called Bumbershoot, "The mother of all arts festivals," and it's a well-deserved moniker. 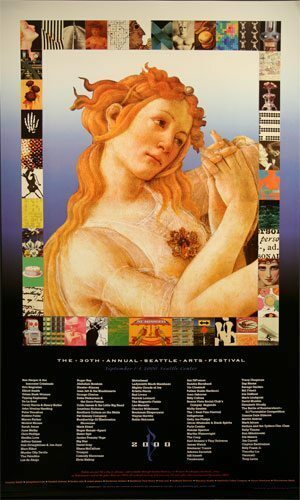 With the Seattle Center's 74 acres of indoor and outdoor stages and galleries, filled with over 2,500 artists in every genre, including music, dance, film and video, literary arts, kids, comedy and culinary arts, as well as visual arts, the annual Labor Day Seattle Arts Festival is the ultimate celebration of the creative spirit. And one worth traveling for. It's always a tough call to determine which of the fifty or so performances by national and international performers to check out each day, let alone how to decide between the hundreds of smaller performances, art shows and impromptu events. The best bet is to pick the one or two things you don't want to miss each day and then fill in the blanks with whatever else is happening at the time. The beauty of Bumbershoot is that you never know what wild art you might stumble across -- the next Grammy-award winning band or world-famous artist could be showing right beside you. Then again, it could just be some outrageous performer in a colorful hat whose name you never caught, but boy, was he wacky! In addition to notable performances by artists from around the country and the world-- The Buena Vista Social Club and the Urban Bush Women were just two -- the 30th Anniversary festival included the popular One Reel Film Festival, an international turntable DJ competition, a circus arts stage, literary readings, a group wedding ceremony performed by Father Guido Sarducci and an after-hours explosion of performances and events at other Seattle area venues. There's so much going on everywhere, it's as if the entire city is expressing its creative energy at the same time. But that's not unusual for Seattle. As the epicenter of the Caffeine Coast and home to many of the country's leading technology companies, music trends and arts venues, this is a town that can afford to take the arts seriously (and with a good dose of humor). And does. One Reel also produces Teatro ZinZanni on the Embarcadero at Pier 27/29 in San Francisco, a one-of-a-kind dinner theatre extravaganza combining circus, music, spectacle and a six-course feast! If you're looking for another reason to visit San Francisco (do you really need one? ), look no further than the San Francisco Fringe Festival, September 7-17, featuring 10 days of over 200 theatre performances by troupes from around the world. You could watch plays all day and night and never have to leave your seat! For a real multicultural experience, you could also take a break and check out the dragon dances, performances and food at Chinatown's Autumn Moon Festival on September 9 and 10. But no happening quite defines San Francisco like the Castro's local Halloween Parade. If you can imagine it, you'll see it, as thousands of people take to the streets in the most bizarre and outrageous display of creative costuming on the planet. Several smaller cities and towns between San Francisco and Seattle also have wonderful happenings this time of year. From wine, arts and harvest festivals to cowboy music, rodeos and pow wows (even an Alternative Fuel Fair and Electric Car Race! ), the Caffeine Coast is a happening place to be this fall. There's so much going on it's hard to choose. Just stock up on the double espressos and you'll be fine.